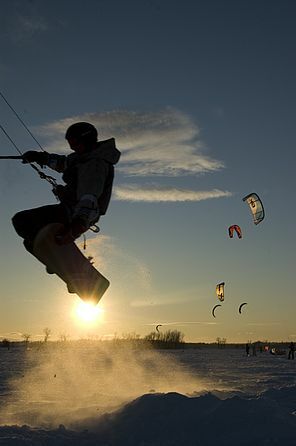 Colorful kites catch the sunset's glow as snowkiters soar through the air over Lake Champlain. Photo by Rob Swanson. Lake Champlain Committee (LCC) Board Chair Gary Kjelleren has always loved water and wind. His mother’s family have been Vermonters for over 200 years and his great grandfather built a camp on Thompson’s Point in Charlotte in 1903. The camp has changed little since then and is still in the family. Lake Champlain was his childhood playground, and remains so to this day. A lake enthusiast, he grew up fishing, swimming, snorkeling, scuba diving, sailing, paddling and exploring the rugged shoreline in the Split Rock area. He became passionate about windsurfing and ice sailing after completing graduate school and then discovered kiteboarding which led to him explore snowkiting. The article that follows is drawn from a recent interview with Gary about the sport and his outings on Lake Champlain. Throughout the winter, Lake Champlain’s vast tracts of ice and snow provide the perfect conditions for snowkiters like Gary Kjelleren. A brand-new sport in the late 1990s, kitesailing (the summer version of snowkiting) quickly took off in popularity. A kitesailer uses a large sail-like kite to catch the wind, while they skim and jump over the water’s surface on a finned water board. Anyone who has spent time on the shores of a large lake or ocean is likely familiar with the colorful, crescent-shaped kites that swoop jauntily through the air, a small human figure skipping along behind them. Gary got into the sport early in its development, in the summer of 2000. It didn’t take long at all for him and his friend to become hooked. However, with the harsh northeastern winter descending on the lake, their learning progress was cut short – or so one might have thought. Invested in the sport and willing to innovate, the two kitesailers used skis and snowboards to sail across the ice. Snowkiting proved to be even easier to learn than kitesailing, although falls on the hard ice could be unforgiving. Snowkiting is a fast sport, and Gary is known to be a bit of a speed demon. He participates in the Global Speed Ranking, which draws participants from as far away as Europe and Antarctica. Snowkiters record their GPS data while kiting, and then upload it to a group in New Hampshire to compete for the fastest times. Some years ago Gary himself came in first, with a speed of almost 70 miles per hour (mph). Kitesailing is one of the few recreational sports that can be practiced on Lake Champlain year-round. 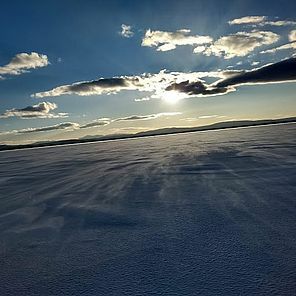 As snowkiting becomes more popular Lake Champlain has grown into a regional focal point, with its wide-open spaces, steady wind, and good snow-on-ice base layer. When asked what his favorite aspect of snowkiting was, Gary responded, “there are so many- a day on black ice feels like flying, untracked powder for miles and miles is a blast, jumping and floating through the air is exhilarating”. 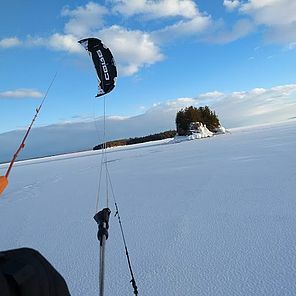 Snowkiting is the perfect way to enjoy the wide-open views of Lake Champlain. Photo by Jamie Leopold. Kitesailing – and by extension, snowkiting – is an easier sport to learn than it may appear. Those who are already familiar with windsurfing, snowboarding, or skiing will find parallels in equipment and technique. It’s strongly advised that beginners start out with a highly experienced kitesailer – or better yet, a certified instructor. Speeding along behind a kite can go from fun to dangerous very quickly, especially on the ice. Jerri and Curt Benjamin are well-known instructors certified with the Professional Air Sports Association. They run the Northshore Kite-Sail-Surf on St. Albans Bay, where they give lessons on kitesailing and sell equipment. Because of the higher risk of injury while snowkiting (due to the hardness of the ice) the Benjamins do not teach during the winter, but for the experienced kitesailer, it’s a fairly easy jump to learn snowkiting. Beginners should be particularly careful when it comes to wind speed. The kites are powerful, and any wind above 15 miles per hour (mph) can easily drag the inexperienced away. An instructor can help you learn to control your kite, and safely depower it so you can come to a stop. One of the greatest advantages of kitesailing is that you don’t need to be in peak physical condition to do it. Unlike waterskiing or windsurfing, kitesailing doesn’t require the upper-body strength to hold onto the kite – the waist harness does that work for you. Plenty of the kitesailers on Lake Champlain, like Gary and the Benjamins, are in their fifties or older. Because you don’t become as fatigued as in other sports, you can comfortably stay out on the lake for hours, flying with the wind. Kiting instructors often provide gear for their students to explore the sport. Photo by Gary Kjelleren. One of the biggest hurdles to getting into snowkiting is the high up-front cost of the gear. Good snowkiting gear – and you don’t want anything less – can run up to hundreds, and even thousands, of dollars. Used gear is nearly as expensive, and you should be careful not to buy anything more than three or four years old to maintain up-to-date safety features. That being said, you will have the opportunity to explore the sport before committing by using the gear provided by instructors. Using kites instead of ski hills can also save money in the long run on mountain passes. Kites, control bars, and harnesses used in summer kitesailing are no different from what’s required for winter snowkiting. Instead of the finned water board, however, you will need either alpine skis or a snowboard to travel over the ice and snow. Snowkiting also requires unique clothing choices. As with any other winter sport, layer your clothing and prepare for sudden weather changes. Choose fabric that will continue to insulate you even if it gets wet, like wool or polyester. Wear a face mask, sunscreen, and goggles to ward off the sun and wind. To protect against the ice wear a winter sports helmet, knee pads, and elbow pads (like those worn by hockey players). Don’t think of it as protection in case you fall down – it’s there to provide cushioning when you do fall down. 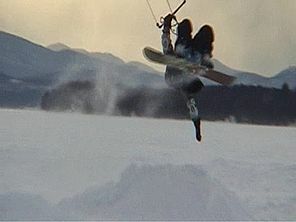 Falling, and getting up again, is an inevitable part of learning to snowkite. Much like on the mountain, you can to jump into the air with a snowboard and kite - but it is vital to maintain proper safety! The hard ice can lead to broken bones. Photo by Sarah Kjelleren. Every activity on the ice, and every sport that involves moving fast, carries a certain amount of risk. Snowkiting involves both, so it is vital that you take precautions at all times. As is mentioned above, beginners should only go out on the lake with an experienced snowkiter or certified instructor. Even experienced snowkiters will benefit from going with a companion, in case they are in an accident. At the very least it’s important to tell someone where you are going, when you are planning to arrive, and when you should be back. Understanding ice safety is also important. Carry hand picks (also called ice claws) to give yourself traction in case you fall through the ice, and learn to self-rescue. Stay alert for open water or thin spots in the ice, and do not go out right after a thaw. Keep a charged cell phone in a waterproof bag in the event you need to call for help – snowkiting can take you miles offshore, far from any town. Wear a pack with basic survival gear – water, energy bars, first aid supplies, an emergency blanket, and hand warmers are all good items to have in case you become stranded. 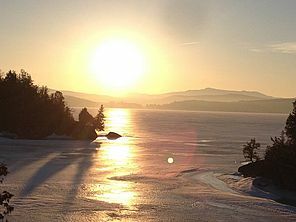 Lake Champlain is full of stunning vistas, especially from the vantage point of a snowkite. Photo by Gary Kjelleren. The lake freezes first in shallow protected bays, and then the ice incrementally covers areas of deeper water and higher wind exposure. Most snowkiters stay in the protected bays, where the ice is thickest and most reliable. A favorite place for many is Sandbar State Park, in Milton. Snowkiters can also be found in Plattsburgh Bay on the New York side of the lake. Another feature snowkiters enjoy is a thick snow cover, which cushions jumps gone wrong on the ice. Fresh powder also provides good traction and a peaceful silence. While everyone else swarms the ski slopes, you can enjoy a day flying across the lake.